Wow, it has been really cold here. Yesterday it was in the mid 40's and raining. When it's this cold I could eat soup everyday, especially a soup like chowder. 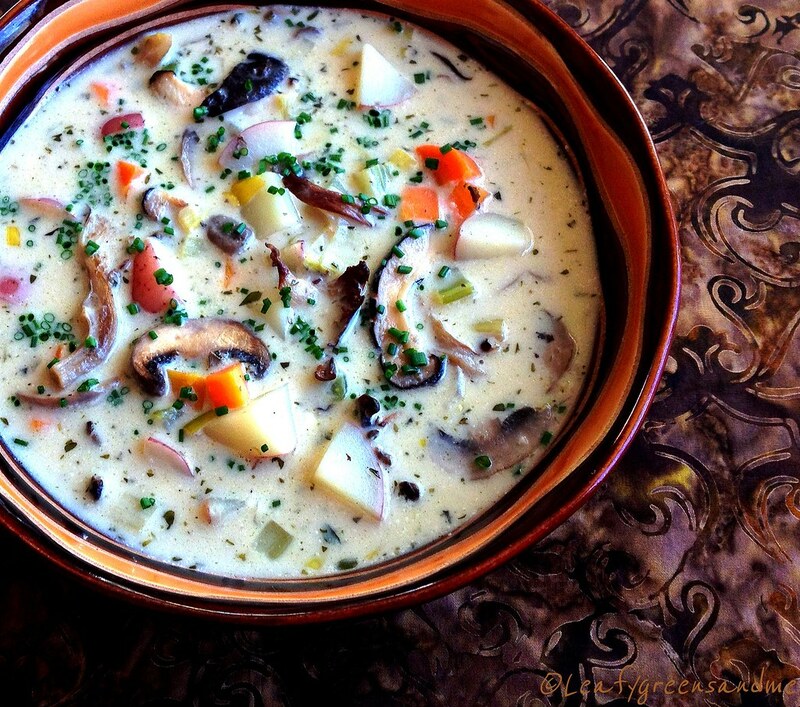 Wild mushroom chowder is one of my favorites--earthy, creamy and comforting, but I rarely ever make it because my husband is not a big fan of mushrooms. It's a texture thing. Oh well...he survived...the flavor of this chowder is incredible! Next time I'll just rough chop the mushrooms and he will never know the difference! Prep mushrooms for roasting. Cremini: wash, remove very bottom of stem and slice thinly; Shiitake: remove woody stem and slice thinly; Oyster: tear into thin strips; and Chanterelle: remove any dirt with a damp towel, remove the very bottom of the stem and tear into strips. Note: Chanterelle mushrooms are very expensive about $19 per pound! You can use any combination of mushrooms you like, or just use cremini alone. I just wouldn't use white button mushrooms because they lack in flavor. I pan roasted the mushrooms in a large skillet with some olive oil and salt and pepper, but you can toss in olive oil and roast in the oven at 425 degrees for about 10-15 minutes until golden brown. Heat a large dutch oven on medium heat, add a little olive oil, leeks and saute for about five minutes until leeks soften. Add fresh thyme, garlic, carrots and celery and deglaze with 1/4 cup of dry sherry and cook until liquid is absorbed, about 5 minutes. Next add vegetable stock, Worcestershire sauce, hot sauce and bring to a boil, reduce to medium heat and cook for about 10 minutes. Then add roasted mushrooms and potatoes and cook for another 10-15 minutes until potatoes are tender. Temper the cashew cream into the soup (remove some soup and place into a bowl, stir in the desired amount of cashew cream and add the mixture back into the soup). Add the remaining dry sherry and heat soup through. Season with salt and pepper to taste and garnish with chopped chives. Drain and rinse cashews and place in a blender. Add enough water to cover cashews and blend on high until creamy. You may need to strain the mixture if you are not using a high-powdered blender. I made this yesterday and really enjoyed it! I was shocked at how creamy it was. Fantastic! This looks amazing! I stumbled across this soup on Pinterest. Don't stop sharing! I know it's discouraging when people don't comment on your blogs ( I have 3 and rarely have commenters) but know they are looking. We need more plant strong recipes out there! I have made this three times! It's absolutely delicious! Thank you for this great recipe. Kzingher...I'm glad that you really liked the recipe. I do too...roasted mushrooms and cream...nothing is better! I just made this today for lunch, and both my husband and I really enjoyed it! Thanks for sharing: I'm just switching to a plant based diet and need all new recipes. Thanks again for sharing! Thanks Unknown...I'm glad that you and your husband really liked it. Unfortunately, my husband doesn't like mushrooms so we don't eat this as often as I would like to! Hope you're enjoying eating a plant-based diet!